It’s golf time, but the weather isn’t quite cooperating, at least if you want to ride in a cart. 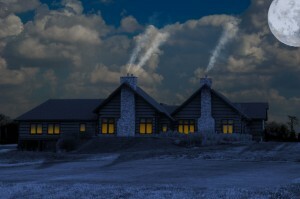 The weather is wet, and it’s cool, which inspired me to share this moonlit night shot of the clubhouse, fires in the fireplaces, a perfect night to be by the golden fire with something warm to drink. So bottom line, bundle up, warm weather is almost here!